These bottles have a large opening which is great for pouring or drinking from. 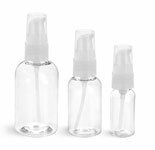 These clear PET bottles feature a different neck finish which can only be paired with compatible tamper evident caps. Click the 'Add Ons' button below to buy matching caps.